City Rural Insurance Brokers have been servicing Luca Group's insurance needs since 1995. Over this time their service has been exceptional, attending to all our needs in a prompt and professional manner. Their claims process is quick and simple and the outcome has always met or exceeded expectations. The management and staff have always provided a professional and friendly service and present to us the best insurance options available, whilst assisting us when we need to make a claim. We have no hesitation in recommending City Rural Insurance Brokers to anyone wishing to review their insurance portfolio. On behalf of Adelaide Fringe I am writing to acknowledge the work of City Rural Insurance Brokers Pty Ltd with our organisation and to affirm their comprehensive understanding of our organisation and their on-going supportive and collaborative work with us. Adelaide Fringe - Australia's largest arts event - is an annual open-access arts festival run over four weeks in Adelaide during February and March. Artists from around Australia and across the globe participate alongside home-grown talent, in art forms spanning cabaret, comedy, circus, dance, film, theatre, music, visual art and design. Adelaide Fringe takes over the entire city with over 1,000 events staged in pop up venues in parks, warehouses, lane-ways and empty buildings as well as established venues such as theatres, hotels, art galleries, cafes and town halls. Aside from the Fringe Club, Adelaide Fringe does not run venues itself. What we do is advise, encourage and assist venues to be as successful as possible. Adelaide Fringe also operates a vibrant and extensive box-office operation, Fringetix. Our broker at City Rural, Andrew Benda, has been working with Adelaide Fringe since 2008; Adelaide Fringe has been a client of City Rural's since 2002. In this time Adelaide Fringe has grown from a few hundred shows to over 1,000 and now includes large-scale, public events such as the Opening Night Parade. In the time Andrew has been handling our insurance, he has dealt with Astronauts hanging off city buildings, giant inflatable 'walk through' art, fireworks launched off city buildings. Throughout he has worked with Adelaide Fringe management to ensure we have vicarious liability to protect us for the liability exposure. 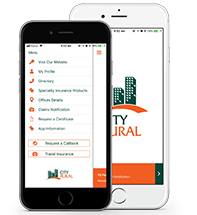 City Rural has also arranged specialist insurance for some specific shows. Each year Andrew re- negotiates our insurance policies; the existing cover is reviewed and past claims are learnt. The insurance is customised to provide Adelaide Fringe with the best cover possible. Andrew works with us to minimise uninsured losses. For example he has negotiated to include consequential loss cover in the insurance for equipment that we hire in the event that items are damaged. Andrew achieves the best possible for Adelaide Fringe while also making it as easy as possible. He does this effectively and comprehensively because as an arts specialist, he knows our business model and our needs really well; he understands our deadlines and understands that ours is not a 'nuts and bolts' business but an ever-evolving business. Program changes occur each year and Andrew tailors our cover to meet these changing needs. He understands what we do, where our exposure lies; when making recommendations, he does so clearly, concisely and with great understanding. He always makes it his business to make Adelaide Fringe aware of new products especially for our insurance needs around new technology. When a claim arises, he is available to assist throughout the process and always negotiates with the claims handlers for the best possible outcome for us. The assistance provided during the claims processes ensures it is simple and easy with minimal disruption. In all ways Andrew Benda and City Rural work with the Adelaide Fringe as true collaborators. They help Adelaide Fringe achieve great success as Australia's largest arts event each year and in so doing work with us to create a sense of real community in the city of Adelaide. The City Rural-Brownways Transport business relationship, commenced in March 2004. At this time, the Brownways Fleet consisted of just one truck. During the past eleven years, that fleet has grown to over forty heavy vehicles, warehousing, property and plant. Andrew Benda and his company, City Rural Insurance Brokers, have been an integral part of our growth, by way of sound business advice on all facets of insurance including, Business, Management, Liability, CTP Vehicle insurance, and Comprehensive cover for Farm, Farm vehicles and relevant equipment. During this eleven year period, Brownways has had some forty three wide ranging claims, all of which Andrew has personally assisted with. These claims have varied from stolen and total loss vehicles, salvage, business litigation matters, theft and fire, to name just a few. Andrew's advice and direction to a satisfactory resolution to these issues has been invaluable. Both Andrew and I are in close regular contact, so as to ensure the accuracy of all the policies, including at least an annual personal meeting for which Andrew travels from Adelaide. With this personal service, we gain a more comprehensive understanding of past, current and future events that may impact upon our company. Brownways have found Andrew's thorough knowledge and understanding of our company requirements as great asset in the growing and sustaining of the largest private Road Industry Air Freight company operating in Australia employing in excess of forty five staff, with an annual turnover surpassing ten million dollars. We trust the City Rural-Brownways partnership will continue to grow for both companies and would like to take this opportunity to once again thank Andrew and his staff at City Rural for all their assistance, and highly recommend their services to all those who recognise the importance of sound insurance advice.